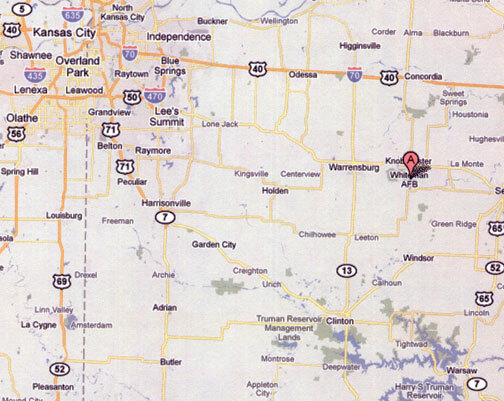 Whiteman AFB at Knob Noster, Missouri, is marked with red marker 70 miles southeast of Kansas City, Missouri. Map by Google. Updated August 7, 2010 / Original report June 25, 2010 Beverly Hills, Florida - During Japan’s air attack on Pearl Harbor, Hawaii, on December 7, 1941, Second Lt. George A. Whiteman got his P-40 Warhawk into the air, but was hit by enemy fire and became the first American military man to die in World War II aerial combat.